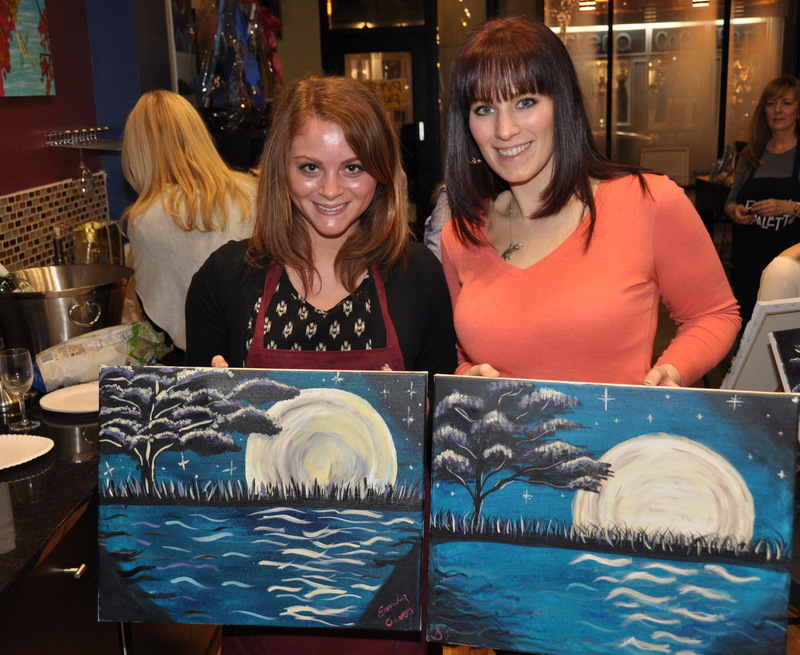 Our review of the new Pinot's Palette in Red Bank, an art studio where you can drink, paint and have fun. 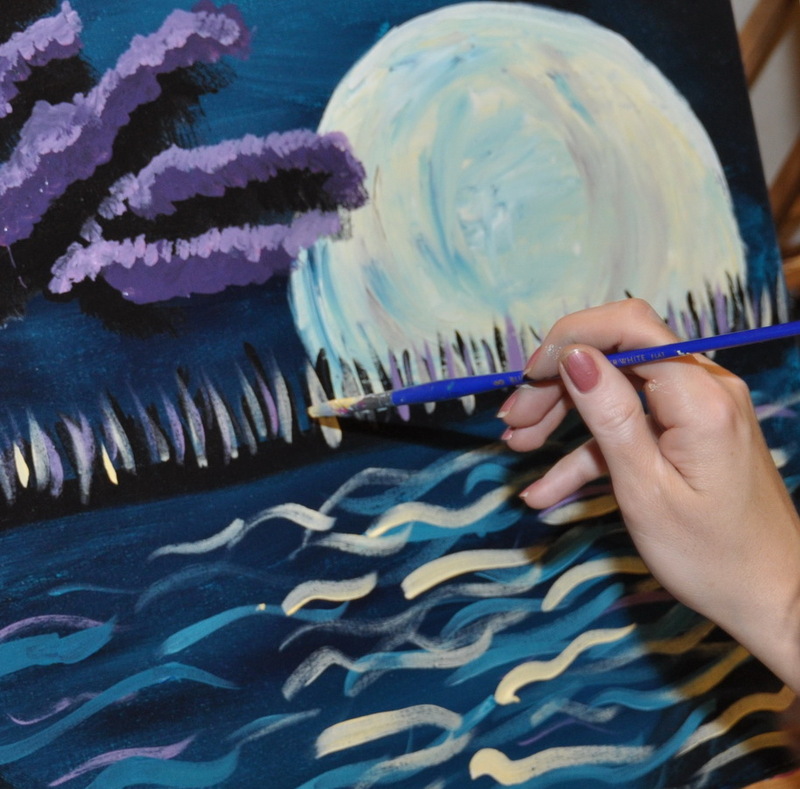 No experience required, bring your favorite wine and go through the steps of creating your very own painting. Read our review and make your reservation! Perfect for a date, girls night out or birthday party. 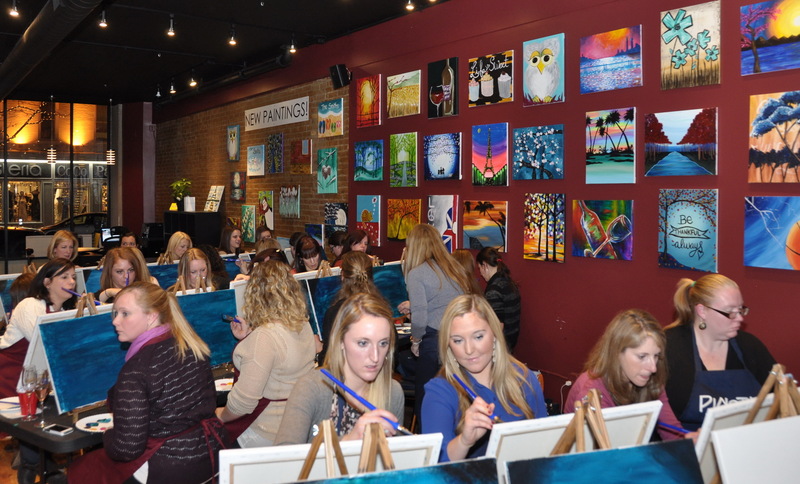 One of the newest additions to Red Bank‘s downtown landscape is Pinot’s Palette. You might’ve noticed it on Broad St, near Mac Attack or Patrizia’s, and across from (the also new) Gotham. There couldn’t be an establishment more fit for the Red Bank scene than Pinot’s, which combines two of the town’s main draws: art and drinking. You can see a lot more pictures in our Facebook album. 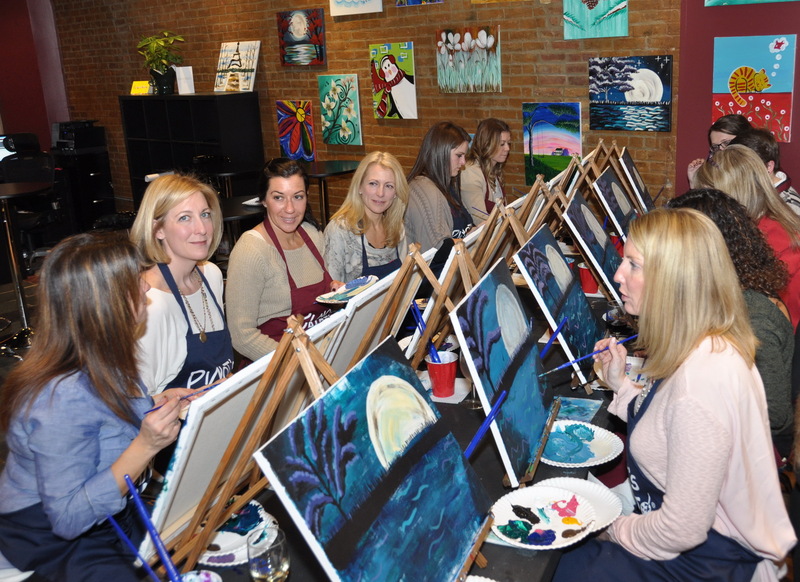 Basically, Pinot’s Palette is a friendly, beginner art class, with a twist: you bring your own wine, drink while you paint, maybe also snack, and most importantly have fun! Many people are intimidated by the idea of creating a painting from scratch, but Pinot’s makes it really easy. They have all the supplies ready for you: canvas, colors, palette, three brushes, water glass and napkin. Then the instructor will guide you step-by-step through the entire creative process. I bet most of you never know how a complex, colorful painting comes to life. I went to Pinot’s Palette a few days ago, together with my wife. None of us had really painted before so we were probably the perfect test subjects. The place is set up like an art studio, with several rows of tables with easels, that can accommodate over 40 people (and it was packed, even on a weekday evening!) There’s also a private room for parties of minimum 10 people, perfect for bachelorette parties, girls nights out, birthdays, etc. And yes, I have to admit this is a women-centric attraction, but it’s also a great place to go on a couples date, like we did! After the corks are popped and the wine starts flowing, the real fun begins. There’s a different painting being created every night (the calendar is on their website), and we had the Midnight Moon Glow. We were instructed which colors to mix and how much to scoop, and then started filling the background, drawing the horizon, painting the moon, tracing the tree and so on. It’s all very interactive and the instructor knows how to make it fun, both with breaks for more wine (actually to let the paint dry), mixing each step with appropriate music, encouraging the painters to sing or to do air drums and so on. Both the drinks and the realization that you are creating a piece of art makes it for a very fun night. Before you know it, the 2 hours are almost up, and you see a real painting on the easel in front of you. A painting that you created and that you will sign at the end! And there’s no reason to fear painting any more. 40+ people participated in the class, and there was not one bad painting. As long as you remember not to dip the brush in the wine, or drink from the cup where you clean the brushes, everything will be good. 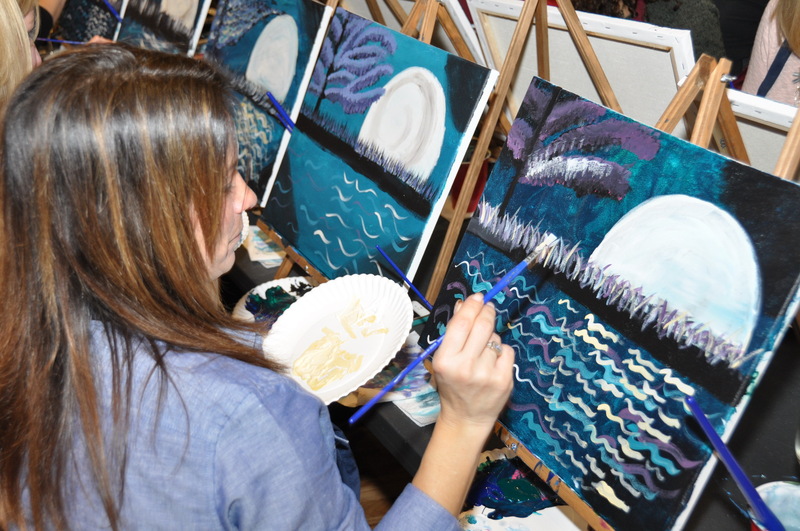 So if you’re planning for a fun or romantic date soon, especially with Valentine’s Day coming up, consider spending a couple of hours at Pinot’s Palette in Red Bank. It’s also the perfect spot for a girls night out, and for the price you pay, you go home with a beautiful painting to hang on your walls. Just make sure you make your reservation in advance since most nights sell out a few days before.